Here are a few photos and letters/emails received from new owners and comments on their new family member. Special thanks to Proctors for sharing with me this special moment..
Who say's older dogs don't make could family pets - This picture speaks for itself! Carmen is sometimes referred to as an "older" dog. In fact, she has barely turned one year. Yet, she is perfectly trained. Her first night with us, she went into her crate and didn't howl, the way a new puppy would. As a new girl in our household, of course, I was concerned about mistakes - NONE. She is so quick, we have already taught her new tricks. And, she was socialized so well at Crinan, she took to visitors with no problem, and our family ways. She LOVES to play, and we love to play with her. We roar at her antics, she is so innocently hilarious. She is extremely obedient and the excellent training she has had at Crinan means she listens, even to me, her new owner. She always watches me, looking for commands which she is quite willing to follow. If you want a dog that is pre-trained, and can't put up with that "puppy-stuff", I would HIGHLY recommend an "older" dog from Crinan. First off, Carmen is not old. She is one year. 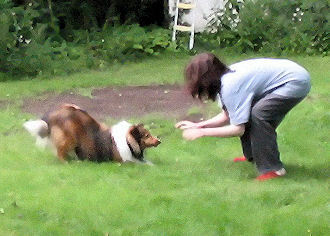 Secondly, Evelyn is not only an excellent trainer of dogs, she is a mentor, consultant, and the Champion of her dogs. She cares about what happens to them. And "older" dogs offer so much. They have so much love. They have attitude BIG TIME. They have their own personalities, waiting to be discovered. And they have so much LIFE in them. 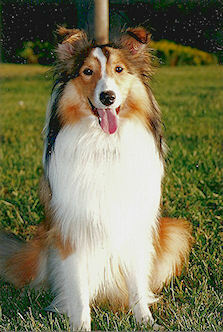 We cannot thank Evelyn and also, Bonnie of Highledge who referred me to Crinan as a most excellent breeder, enough. We have received a very, very precious gift, which we will continue to hold in that high regard. Just to let you know how I am doing, so I am writing to you. You remember your Carmen? I am doing extremely well. Pictures attached. I do miss you, but I love my new family as well. My new mummy and I walk almost every night, and I have met so many new friends. 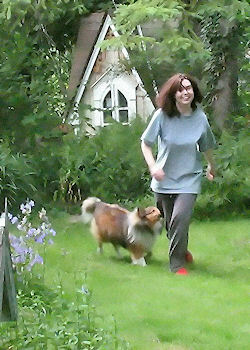 There is Emily, the Shiztu, there are Baily and Bradley, the Shelties down the street, Rowan, another Sheltie I've met (he is very small). My bestest friend in the world is Teaser. He is my next door neighbour and a Maltese. Hence the name. Teaser and I play all day. I am spayed, according to conditions, so no casualties! I love my new family and have settled in extremely well. I have been here almost a year, and my new family just adores me. What is truly surprizing is how my new mummy's husband has taken to me. He is so kind. He cleans my teeth. He takes me to the vet. We play during the day. My new mummy never expected that. But I guess I fit in so well, and I was such a good girl, he fell in love with me. Now, I am almost closer to him than her. But I still love Mummy, and follow her around. I do miss you and of course, you are welcome anytime to see your Carmen. But we are very happy. Thank you thank you, from the bottom of my heart. Carmen and Susan Proctor, Thanks so much. I thought we would drop you a line to say hello. 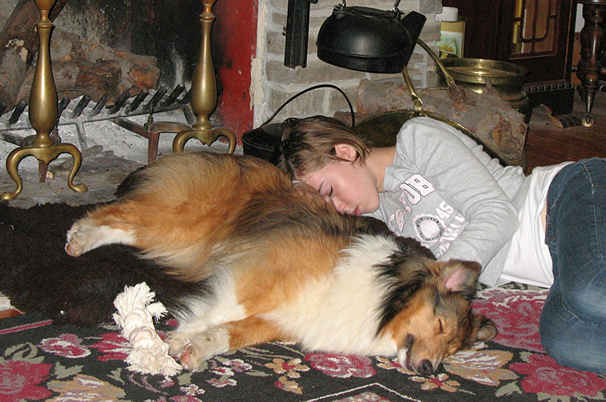 Many years ago, we met you when we were looking to adopt our first puppy. Ric and I adopted Mozart over 15 years ago. A couple of months ago, Mozart passed away, after a very long and loving life! Thanks to you, and your careful and expert breeding, Mozart remained healthy and was a part of our family for sooo many years! Mozart was the most intelligent, fun-loving pet anyone could ever dream of owning, and was totally loyal right to the end. We miss him desperately, but cherish the memories, and felt we would drop you a line to say thanks, for introducing us to Mozart and all those wonderful years we enjoyed.We hope you are well.